CMHC Public Housing Scheme for Montreal (McGill University) MS receives CMHC travelling scholarships for five weeks. Produces " Report on some aspects of housing in North America. Thesis "A case for city living/a three-dimensional modular building system". Thesis publishes in journal 'Habitat'. Apprenticeship with Louis Kahn in Philadelphia Invited by Sandy van Ginkel back to Montreal to implement his thesis scheme for Expo '67. (SVG in charge of planning). Dr. August Komendant is the structural engineer for the project. Feasibility Report submitted by Canadian Cement Companies to Col. E Churchill of the Department of Installations for the Canadian Corporation for the 1967 World Exhibition. *Envisioned a permanent structure for Habitat. Safdie opens own office with John. B Parkin, then David, Barott, Boulva architects. 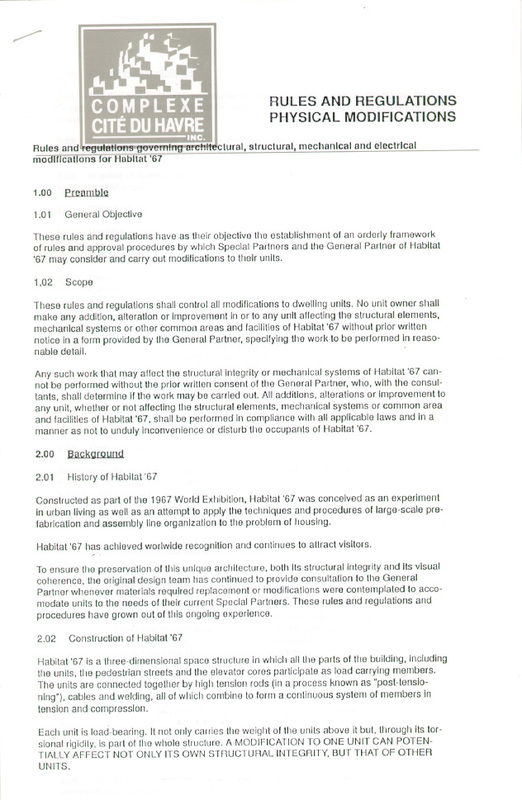 Redesigning of Habitat from a $42 million scheme to a $22 million scheme, which was subsequently rejected by the Treasury Board. MS then developed two options, a 10 story section and a 22 story section. The 10 story action was finally approved on October 28. Budget revised to $13.5 million (federal 50%, provincial 37.5%, municipal 12.5%. May 1964-Nov 1965: Final plans completed. Part on exhibit (26 units), part for rent. Construction deficiencies corrected (street paving, flashing, roofing). MS awarded 1967 Construction Man of the Year Award from "Engineering News-Record". 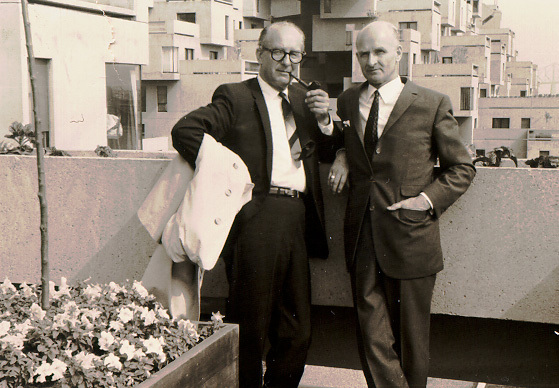 MS awarded 1967 Massey Medal for Architecture in Canada. CMHC rented only 26 of 114 units. Technical reports by Jean Eudes Guy to complete north Cluster. June: Report for corrective maintenance program by J.E.Guy and Al Meyer with David, Boulva architects. Dr. Komendant inspection tour sponsored by CMHC. Revenues of $1.5M with expenses at $1.4M (excluding mortgages). *Dec: CMHC agreed to transfer Habitat to tenant company: Housing Complex '67 and Co. Ltd, therefore tenants become owners. Management by Complexe Cite du Havre (Pierre Brien). Jan 31: Pierre Heafey, notary buys Habitat from CMHC for $2M plus $8M. Feb: Housing Complex '67 purchased Habitat from Heafey at $3.35M ($8M debt to CMHC). MS sought classification to protect Habitat from alterations by developers  not given. architect to be named by MS as his representative in Montreal. *May: Habitat Bill of Rights: bye-laws for residents in the maintenance, construction, painting etc. Dec: lobby work, waterproofing of plaza level.